Sometimes I think my postal carrier hates her job. I was sent a priority envelope with specific instructions on the outside to not bend or fold. What does she do? Folds it in goddamn half, crams it in the mailbox and jams mail on top of it. Thanks. 1. Burger King cheesy tots are great. 2. For decade if you go in to pre pay for gas they type the amount to pump in and it auto cuts off when it gets there. Also for decades pumps have had keypads on them for credit card stuff. So why cant I input how much gas I want just like that and then it auto cutoff when it gets there?? Because that takes time and effort to port the code from a central station to each independent pump. Oh, and, of course, every change has to be tested to make sure it's not going to blow up you and the surrounding city blocks. It might be a good selling point though. The big problem being that you're introducing change to us, the simple minded population. And change that makes me take five seconds to read and respond "full tank" My problem is usually the opposite though. If the credit reader is having problems or if I want to pay in cash, it's impossible to pre-pay with "can I just fill er up?" Somehow that's a big challenge for a clerk. Blame the thousands of people that drove off with full tanks because prepay requirements weren't a thing in the 'good old days'. 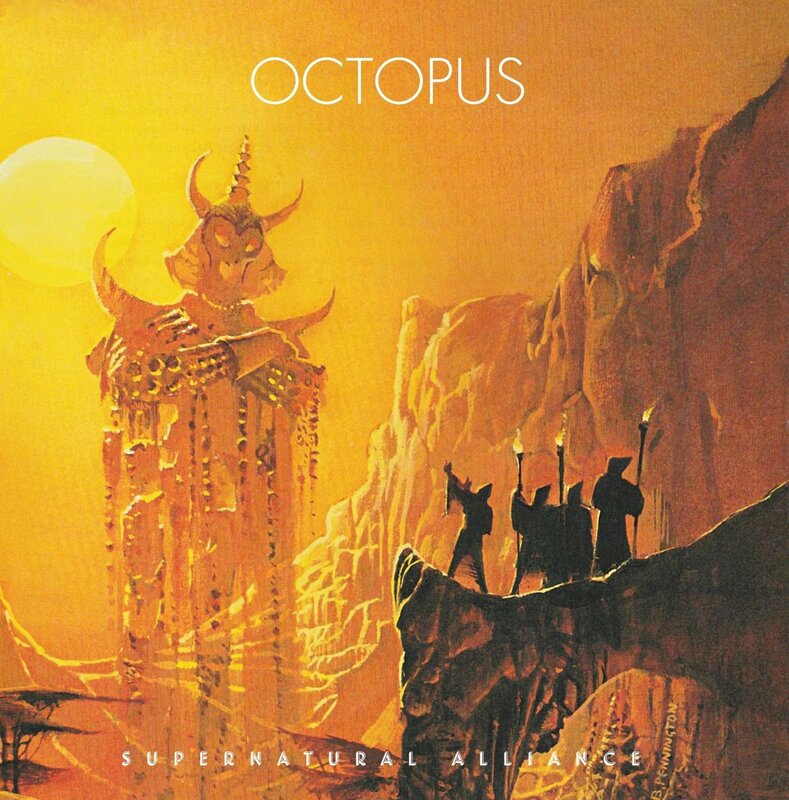 If the music on Octopus' debut album, Supernatural Alliance, tells us anything, it's that the spirit of low-slung and bowel-rattling psych rock is alive and well. After years of paying their dues and letting the spirit of invention propel them forwards, the quintet are now on blistering collective form and beyond ready to conquer the world. Veering from thunderous, Sabbath-fuelled rampages like Beyond The Center and the album's mighty title track to the piano-driven, old school rock'n'roll clatter of Strike (While The Iron is Hot) and the woozy, kaleido-blues of the wryly titled Fleetwood Mac, it's a bold and supremely confident opening salvo from a band that seem to be achieving great things powered only by instinct. With a line-up completed by Matt O'Brien (bass/formerly of Detroit fuzz-funk crew Big Chief), Chuck Burns(drums, also a member of Speedball and Seduce, formerly of Universal Temple Of Divine Power) and Adam Cox (keyboards), Octopus are already firmly connected to the cosmic musical mainframe. The answer is simpler than it sounds. Because if they already have your credit card info and you decide you want more gas (or more likely, aren't paying attention and over pump), they win. Most people aiming for $20 will go over a few cents rather than stopping under. Multiply that times tens of thousands per year. Adding that functionality would cost a lot of money, and would lose them that little bit of extra that probably amounts to hundreds of thousands of dollars per year. Millions of dollars for the larger chains. Websites determine my location based on the source of my internet connection. The source of my internet connection is 60 miles from here. I cant find anywhere to hear even samples of them or that album. And $25 for a vinyl copy? Wow not like the old days. Surprisingly, it's almost exactly like the old days. A major-release vinyl LP in the mid-80s cost about $10. Adjusted for inflation, that's about $24 today. Considering that vinyl releases are now a specialty item, I'm surprised they don't cost more. Just found out that a co-workers son committed suicide this week. This son and his wife just had their first child right before Thanksgiving. Jesus, I can’t even imagine. Depression and mental illness such is a horrific, awful disease. That's awful. I can't imagine. Blackhawk wrote: The answer is simpler than it sounds. Because if they already have your credit card info and you decide you want more gas (or more likely, aren't paying attention and over pump), they win. Most people aiming for $20 will go over a few cents rather than stopping under. Multiply that times tens of thousands per year. That doesn’t sound like a viable answer, for a few reasons. The gas station really isn’t going to gain anything by you spending a few cents extra. If you buy a few more drops of gas, they make the same amount of money as they would if the next person buys those drops of gas. Gas stations sell all of the gas that they have, always. Who they sell it to doesn’t matter. Also, why would adding that functionality cost a lot of money? It’s trivial to implement, and almost every gas pump probably already supports it because states like NJ have it for attendants to use. I mean, you could be right (since I don’t know the actual answer if not all pumps support this), but it doesn’t make a lot of cents to me (get it!!). There's just something about this picture that warms my cynical heart. Two-year-old Parker Curry was so awestruck by the towering portrait of Michelle Obama that every time her mother would try to get her to turn around to take a picture, she would not stop staring at it. Picked up a pair of split chicken breast yesterday and have had them soaking all day in buttermilk. Will be frying them up in about an hour. EDIT: Got too hot cooking and stepped outside to cool off. Its a chilly night. I was looking up at the stars wondering. Is it cool on another civilizations world right now. Maybe they are cooking food too at that moment. Maybe they are so far advanced they dont need to cook food. Maybe they have evolved so far as to not need it like we do. Or maybe they haven't moved from the water yet or are cooking over a fire in a cave. Then it hit me maybe they are looking up like me wondering about us or others out there. Perhaps they are on the same tech lvl and path we are. They got internet a couple decades back. I smiled and felt better. So, I figured my little Yorkies are about the size of cats,and as they poop and pee in the house all the time I thought I'd treat them like cats. I bought some kitty litter. What the hell. But you know it kind of works. Oh, they don't use it to go to the bathroom in, they ate it. But now when they go to the bathroom in the house it comes out all clumped and easy to pick up. Remember that clay's purpose is to absorb moisture. If they eat very much of it they're going to dehydrate. If you're going to keep putting it down anyway, be sure to buy plain old clay with no additives. Someone on Amazon has a good sense of humor. Well that was big brother'ish. I fired up Twitch and a ad ran first and had a animated thing from Amazon showing me some Brother toner.....which Id looked up the other day. Argh! Pretty sure platforms like Twitch tie to your browser history and/or what you looked at on Amazon. Hence the targeted advertising. There's nothing creepy there. Twitch isn't spying on your Amazon activity. Twitch is Amazon. Think of Twitch as Amazon's game streaming app. It's best to remember that whenever you access anything for free on the internet, you are a product being sold by someone else. When did "creative" become a noun? Among some of my business clients, "the cloud" has been shortened to just "cloud," which functions as an all-purpose noun, adjective, and even verb. Cloud computing, cloud storage, cloud services, the cloud -- it's all just cloud. It offends my copy editor sensibility, but the clients get to specify their own jargon. Perhaps having Amazon Prime giving you Twitch Prime should have made it obvious. What is surprising to me is that we haven't started to see infomercial like stuff on Twitch yet to hock Amazon stuff. Did you notice they have wrestling on Twitch now? I don't if you are too but I was being facetious. Presumably at about the same time that executive became a noun. Personally, I like to think of Twitch as Amazon's live-stream busking app. There's some good live music to be had on Twitch. "Executive" has regularly been a noun since the 18th century. "Creative" has really only become a noun within the past decade or two. How in the hell do roaches get in the microwave? And why does it take so long for them to blow up? The only thing that will stop bad roaches is good roaches with a gun. RE: inability to choose a pre-pay amount at the pump. Exactly. There is no conspiracy or lazy development effort. It has nothing to do with the amount you are willing to pay. It has everything to do with *proving* the amount that you can and *will* pay. I miss stuff from my life...people, pets, items, places, times. One of the items is a Lionel train set my dad got me. Ive never found the exact one but seen close ones. As you can see there's no slots on the track. The track has infrared lights built into it that the cars can read. 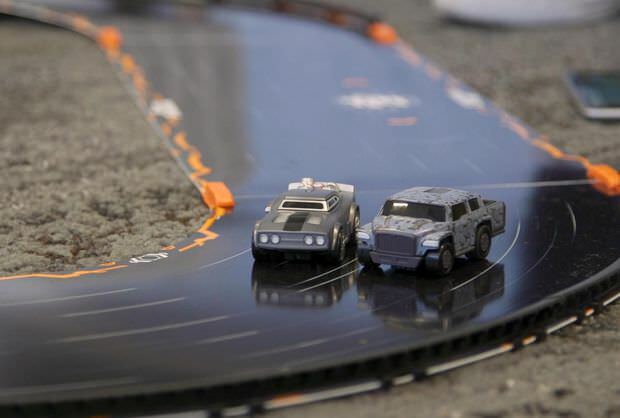 I've never seen it in action, but the cars apparently do a slow first lap (steering themselves) to read the layout you've set up, the cars talk to each other to share what they've learned about the track, then they line up for the race on their own. I don't actually know how much input you give the cars during the race.